Gescrap BB reached the Turkish Airlines Euroleague Playoffs in its debut season in the continent’s premier competition by edging past Unicaja 55-59 in in Malaga, Spain, on Thursday. Bilbao finished the Top 16 with a 4-2 record in Group F, which placed it second behind Montepaschi Siena on a tiebreaker. 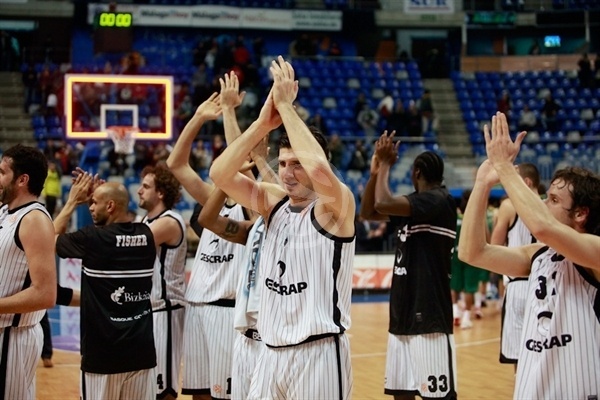 The men in black will next face CSKA Moscow in the best-of-five playoffs. 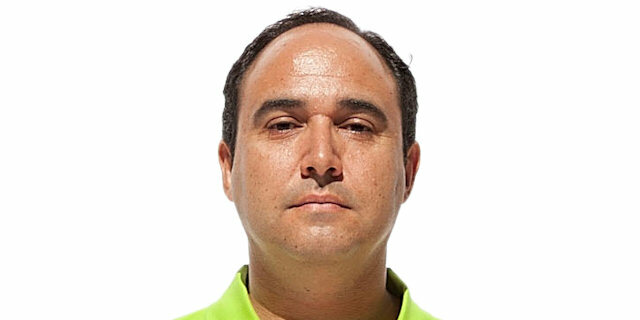 For the second straight week, Raul Lopez hit the key shots down the stretch – a three-pointer to put Gescrap ahead 51-53 and the foul shots to keep it there. Marko Banic and Aaron Jackson led the winners with 10 points apiece, Lopez finished with 9 and Dimitrios Mavroeidis added 8 points, while Axel Hervelle grabbed 10 rebounds. Hrvoje Peric bagged 19 points along with 9 rebounds and Luka Zoric contributed 11 points and 11 rebounds in a losing effort. 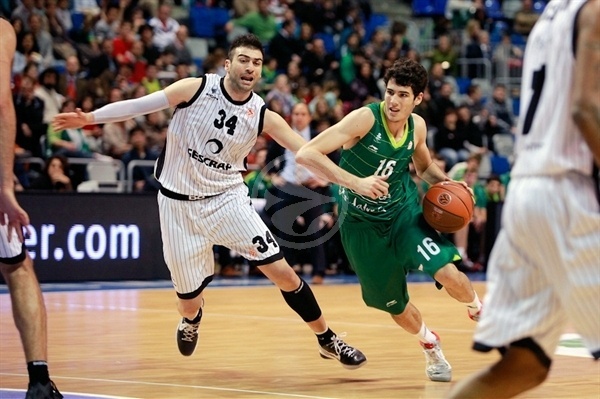 Unicaja bowed out of the Top 16 with a 0-6 record. Gescrap opened a 4-10 lead on baskets in the paint by Hervelle and Mavroeidis, followed by a pair of bombs from downtown by Jackson. After the Blum added a triple, Unicaja hit the gas offensively on consecutive three-pointers by Alex Abrines and a pair of Peric buckets to grab the lead 16-15 at the end of the first quarter. Zoric knocked down a short-range jumper to start play, then Kostas Vasiliadis buried a two-point jumper to set the score at 18-17. Scoring dried up for more than three minutes, then after Unicaja’s Joel Freeland hit two foul shots, Roger Grimau drive down the lane and banked in a layup, moving the score to 20-19. Both teams continued to struggle offensively until Mavroeidis powered the offensive boards and Zoric nailed a two-pointer from the baseline as the hosts held on to the lead, 22-21. Banic’s foul shots provided the last of the scoring, as Gescrap took a 22-24 halftime lead. Mavroeidis and Freeland exchanged layups, then Alex Mumbru hit a jumper in the paint, giving Gescrap a 24-28 lead. Mavroeidis found the range from downtown and Jackson finished a drive with a left-handed layup as the visitors extended the lead to 24-33. After Freeland made both foul shots and Jackson banged in a baseline jumper, Peric drained a set shot from beyond the arc, cutting the difference to 29-35. Mumbru and Zoric swapped two-pointers, then Abrines and Peric each finished off two straight fast breaks with dunks as the hosts got close, 35-37. But then Banic came up with two baskets in the paint along with a foul shot to give the visitors a little breathing room at the end of the third quarter, 36-42. Abrines and Raul Lopez exchanged layups, then Augusto Cesar Lima added a layup and Peric finished off another fast break with a finger roll to pull the hosts to 43-44. 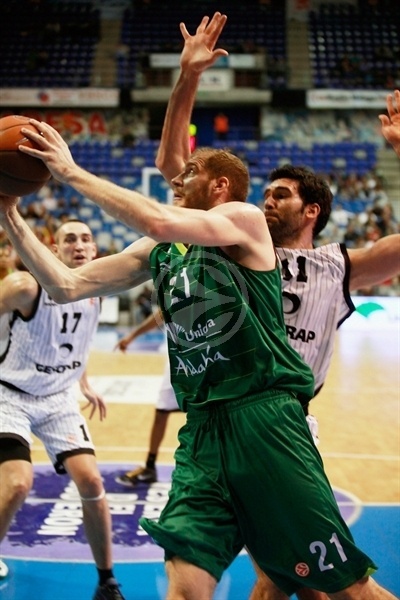 Grimau and Blums drove to the basket for consecutive layups as the visitors fended off the Unicaja 43-48. But the hosts kept coming as Freeland scored in the paint and Zoric added foul shots, reducing the deficit to 47-48. Mavroeidis scored down low, but Peric scored 4 straight points on free throws and a put-back on the offensive glass as the hosts edged out front 51-50. Lopez drained a three-pointer with just over 2 minutes on the clock, then Banic downed a reverse layup to give Gescrap a 51-55 margin with 1:19 to go. Abrines hit two free throws, but Lopez answered with two of his own from the line with 15 seconds to go, giving the visitors a 53-57 lead. E.J. Rowland added 2 more from the foul line for the hosts, cutting the difference to 55-57, and putting pressure on Lopez to make his foul shots with 6.2 seconds to go. He made both to ice the game, as Gescrap squeezed out the win 55-59. "We had problems all week to prepare this game. We gave our best effort on court. We need to keep working to find again the winning feeling. We are sad because we put an end to the Top 16 with no wins. Now that we can only focus on the Spanish League, it's time for us to be back to the winning path and get back the respect we earned at the start of the season. Games are decided in small details, and as long as we keep fighting and competing, we will always be there." "What we achieved today is huge for being our first year in the Euroleague. The players were very nervous and thisis not a game that I can judge because of its qualities because I think it was a bad game. 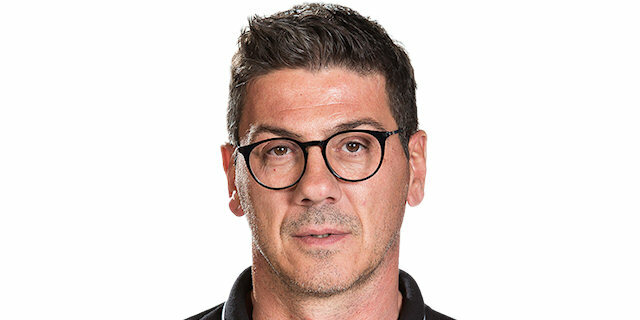 I want to congratulate my players, my technical staff and the club. And most of all, I want to dedicate this to our fans. They deserve it."